The good news is that we have a solid team that will design a program for you, that is healthy, sustainable and custom-made. Sippora Lehrhaupt, MS PA-C has been practicing medicine as a primary care physician assistant since 2007. Over the past several years, Ms. Lehrhaupt has noticed an increase in the presence of medical conditions due to an increase in the weight of her patients. 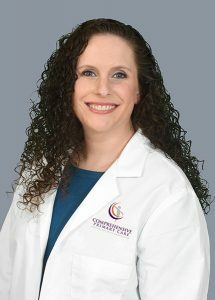 In 2011, Ms. Lehrhaupt joined the American Society of Bariatric Physicians to actively start studying obesity medicine. She has been incorporating obesity medicine into her daily practice of primary care since then and firmly believes in addressing all aspects of an individual (medical, nutritional, psychological, and physical fitness) to achieve and sustain significant weight loss. Ms. Lehrhaupt received her Bachelor of Arts Degree from Yeshiva University and her Master’s Degree in Physician Assistant Studies from Towson University. She is also a member of the American Academy of Physician Assistants. Ms. Lehrhaupt is also a member of the American College of Sports Medicine and is a Certified Personal Trainer by ACSM. Emily K. Lichvar, Ph.D joins the CWMC team as our psychological support group mediator. She has worked extensively in the field of addiction, and served as co-Investigator of a National Institute of Drug Abuse funded study at Columbia University aimed at integrating pharmacological and behavioral interventions for substance-using adolescents with co-occurring Attention Deficit and Hyperactivity Disorder. Dr. Lichvar is highly interested in health and wellness, which is what brings her to the weight management arena. After receiving a diagnosis of Crohn’s Disease in 2006, Dr. Lichvar immersed herself in researching how lifestyle factors (e.g., nutrition, exercise, stress management) affect health, mental health, and well-being. She received her B.A. in psychology from University of Delaware, M.A. in clinical psychology at Columbia University, and Ph.D. in applied developmental psychology from Fordham University. She has taught several courses on psychology, human development, and successful aging at American University in Washington, DC, Manhattan College, John Jay College, and Fordham University in New York City, and Washington State University in the Inland Northwest.